Time to Decide: Thesis in Turkey or in America? It’s been almost two months since I started my new apartment adventure and I’m almost about to be done with everything. 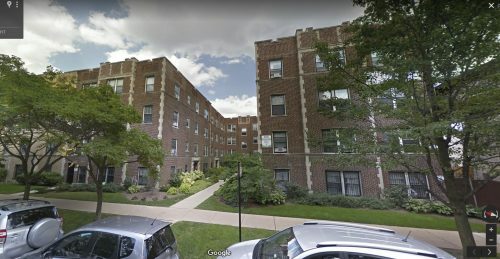 I am going to be moving to my new apartment in a week, and I hope my moving plan will be helpful to any of you guys out there who are planning to move to Chicago and will be dealing with moving. Finally, me and my roommate Ashka decided on the apartment we wanted to move into. It is actually the very first apartment that we went to look at. Most of the time it is always like this for me. I go to do some shopping and I generally end up buying one of the first things I see. But, we are both so happy about the apartment. We will be living in the Lake View, Roscoe Village area in Chicago which is apparently a hidden gem. We are really close to a grocery store and also really, really close to the train station (1 minute walking distance). I cannot wait to move in to the new apartment, although moving is always hard. Two friends of mine who are also my classmates, Urwa and Morgan from Creative Producing program, moved to their new apartment last week. I was one of the people who helped them. Although it wasn’t that difficult for them, it still took time. Unfortunately, I am not as lucky as Morgan since her mother was able to come to Chicago to help her. I have been getting quotes from a lot of different moving companies and the prices are around $350-$400 which is more than I expected. Since I couldn’t get a job at school in the summer (because unfortunately, they didn’t have enough in the budget) I have been trying to avoid spending money as much as possible. So, in this case, $400 is more than the half of the money that I will be paying for my rent. I decided to get a truck from U-Haul and 2 movers from an app called Dolly. Because of the problem that I have with my back, I cannot carry the heavy items that I have like my bed, desk, bookshelf, etc. It is going to cost me around $160 and Ashka will be driving the truck. Google Maps screenshot of my new apartment. Meanwhile, I have been working on my feature script as much as I can. I am still behind and missing the deadlines, but thanks to our professor and also our graduate coordinator Mary Novak (who will be leaving Columbia College Chicago unfortunately), they have been giving me great ideas and teaching me about writing a feature script. I don’t know if I made the best decision of taking this class during the summer, but I definitely think that I have learned a lot about writing a feature script. It is a process by itself and you have to be consistent. Also, I have been developing (or at least have been trying to develop) my thesis idea with my producer Urwa. We are still trying to decide if we should shoot our film in Turkey or in Chicago. Since I started studying Cinema Directing, I realized my ideas are always coming from myself—so, from Turkey. To be able to make something authentic, I feel like I have to be in Turkey to shoot films, which also makes me questions every time I think about my thesis—am I going to be staying in the US when I graduate? I still don’t know the answer to that, but I wonder if anything is going to change when I go back to Turkey in 15 days. I guess I will see. Something that I just learned and makes me so excited is the Chicago Turkish Festival. 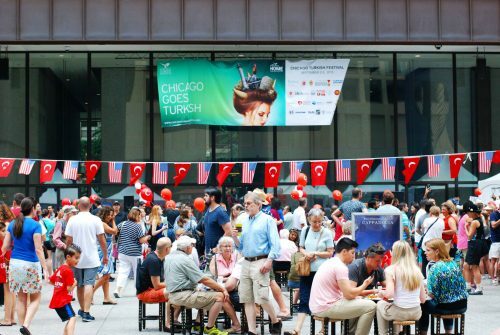 I have been following a couple of Turkish Facebook groups that are for the Turks in Chicago and I saw that they posted something that said, “Chicago Turkish Festival is going to be happening in September. We need volunteers.” I was so excited when I saw that post. I reached out to them and joined the meeting. I will be taking photos and shooting videos of the festival. Anyone who is reading these lines, come and join to the festival if you can! You can click to this link: Chicago Turkish Festival, and get more information about the festival. I am so excited to be a part of this and I hope you can be there to share my excitement. A photo in Chicago Turkish Festival from 2 years ago.